Here you will find answers to almost every question about Banner Island Ballpark. Should you have questions that aren't answered here, please feel free to contact us directly through our Contact Us Page on the website. A's Affiliation: The Ports are the Advanced Class A Affiliate of the Oakland A's. The A's Minor League system includes the Arizona A's (Arizona League), Vermont Lake Monsters (Short Season-A), Beloit Snappers (Class A), Midland Rockhounds (Double-A) and Nashville Sounds (Triple-A). All Ports players are under contract with the Oakland A's. To find out more about the Oakland A's affiliates, click here. ABLE Charter Schools Homerun Hill: Bring a blanket, bring a friend. Enjoy the Stockton Ports game form the best view in the house. The Homerun Hill is presented by ABLE Charter Schools. Alcohol Sales: Beer may be purchased at all Concession Stands, the Jackson Rancheria Back Porch, and at portable locations along the ballpark's main concourse. The Club at Banner Island Ballpark offers a full range of Beer, Wine and Spirits for Club, Scout and Suite patrons only. Wine may be purchased at a number of locations throughout the ballpark, including the Woodbridge Vineyard Cafe adjacent to Section 117. All alcohol sales conclude at the end of the seventh inning, or at any time prior to the end of the seventh inning deemed appropriate by the Stockton Ports. Alcohol may only be purchased and consumed by adult's ages 21 and older, and proper ID is required. The Ports reserve the right to refuse alcohol sales to any guest for any reason. Animals: The only animals allowed in the ballpark are certified service animals. Owners must have appropriate certification in their possession. ATM: There are ATM services located next to the Third Base Express and Home Plate Grill concession stands. Autographs: Guests are encouraged to seek autographs up until 20 minutes prior to the game down the right field line in Sections 119 & 120. Auctions: The Ports host online auctions for memorabilia and unique fan experiences year-round. To view available auctions, click here. The Ports host game memorabilia auctions at the ballpark, including jerseys and other game-worn memorabilia. Jersey auctions take place outside the Ports Team Store. The auction begins when the gates open and ends with the final out of the 7th inning. Jersey winners should be at the auction table during the 7th inning so that they may pay for their winning jersey and obtain a jersey claim form. Upon conclusion of the game, jersey auction winners should meet a Ports Representative at the top of section 117/118 at the end of the game to be escorted onto the field and claim the jerseys from the players. Back Porch presented by Jackson Rancheria Casino and Hotel: The Jackson Rancheria Back Porch is located on top of the radial wall in right field. The Jackson Rancheria Back Porch is a truly unique place to watch a baseball game, as it is home to 50 wooden, Adirondack rocking chairs. Featuring a raised seating area, beverage and food sales under a trestle and other amenities such as TVs. This is an excellent place for a Group Outing. Individual tickets are not sold for this location. Ballpark: Banner Island Ballpark opened in 2005. It is a Class-A minor league ballpark owned by the City of Stockton and operated by International Facilities Group. The Stockton Ports Professional Baseball Club is the primary tenant under a License Agreement with the City of Stockton. Designed by HKS Architects (Dallas, TX) the ballpark is located in downtown Stockton, CA on a Delta waterfront setting. The sunken diamond playing field, with splash landings beyond the right field Back Porch and a short porch left field mini-monster wall lend to a unique atmosphere that also features indoor batting cages on the 360-degree walk around concourse and waterfront picnic tables for dining. Ballpark Tours: Behind the scenes tours of Banner Island Ballpark for groups are available by reservation only. Contact the Ports front office at 209-644-1900 for more information, or to arrange a tour for your organization, classroom or business. Banners/Signs: Fans may display signs that are in good taste and that do not pose an inconvenience to other fans. No signs or banners may be hung on/in the field of play or contain advertising without the expressed written consent of the Stockton Ports. Baseball Camps: The Ports offer an annual summer baseball camp with instruction from Ports players and coaches, as well as the occasional pre-game clinic. For more information contact the Ports front office at 209-644-1900. Batting Cages: The Ports Batting Cages, presented by the Stockton Police Officers' Association is located on the concourse behind Sections 118 and 119, invites fans to come test their ability to hit what the pros hit. $1.00 for 3 swings. Teams or groups wishing to reserve the batting cage prior to a Ports game for private use should contact the Ports front office at 209-644-1900. Little Leagues may register for a free 45-minute session nightly. Contact the Ports at 209-644-1900 for details and availability. Birthday Parties: The Ports offer memorable birthday parties at Banner Island Ballpark for young Ports fans. Parties include meals, souvenirs, tickets to a game and more. To book your party or learn more about party options, check out the the Birthday Parties page on or call 209-644-1900. Box Office: The Ports Box Office is open on game days from Monday-Friday from 9 a.m. until the end of the game. On Saturday game days, the Box Office is open from 10 a.m. until the end of the game. On Sunday game days, it is open from 10 a.m. until the end of the game. On non-game days, the Ports Box Office is open from Monday-Friday, 9 a.m.- 5 p.m. and closed on Saturday and Sunday. Broadcast Information: Check out all 140 Ports games on the radio by tuning into KWSX 1280 AM. Ports broadcaster for the 2016 season is Zack Bayrouty. Express Transmission BBQ Pit Stop/Group BBQ's: Groups of 25 or more can enjoy All-You-Can-Eat BBQs at Ports games in the Express Transmission BBQ Pit Stop, located in left field behind the bullpens. BBQ options can include tri-tip sandwiches, hot dogs, sides, beverages and a ticket to the game. To find out more, contact a Ports staff member at 209-644-1900 or visit this Express Transmission BBQ Pit Stop page. Cameras: Cameras are allowed in the ballpark during all regular season games as long as they are not professional cameras and not for commercial use. Camps and Clinics: The Stockton Ports will hold an annual kids baseball camp each year, and may potentially hold a few pre-game clinics. For more information on the camps, please contact our front office at (209) 644-1900 or visit this youth baseball page. •Paid admission tickets to canceled Stockton Ports games may be exchanged for tickets to future regular season Ports games, subject to availability. No refunds will be given. Tickets from postponed games that will be played at a later date will be good for the make-up game. •Tickets purchased at the ballpark should be exchanged at the Ports Box Office, or mailed to the Stockton Ports, 404 W. Fremont St., Stockton, CA 95203. •Tickets purchased through tickets.com can be exchanged at the Ports Box Office. •Complimentary tickets will be exchanged for a future regular season Ports game, subject to availability. Complimentary tickets have no cash value, cannot be refunded and cannot be exchanged for a higher priced ticket by adding payment. •Group customers will receive a call from their Ports representative explaining their exchange and re-booking options. Fans can also visit here to learn more. •All guests that paid for parking are not allowed to exchange their parking passes and money will not be refunded. Carry-In Items: All bags must be no larger than 16'' x 16'' x 8''. All bags, including backpacks and purses, are subject to search. No cans, weapons, glass containers, food or beverages are allowed into the ballpark at any time. No hard-sided coolers of any size are permitted. Diaper bags are permitted for guests accompanied by their babies. Strollers must be small enough to keep out of walkways. Cell Phones: For the courtesy and enjoyment of those seated around you, please limit all cell phone calls to a minimum. For phone calls extending more than three minutes, we ask that you please continue your conversation in the concourse area. Childrens Tickets: All guests 24 months or older must have an appropriate ticket for entry. Toddlers under 24 months do not need a ticket to enter the ballpark, but they must sit on the lap of an accompanying adult. Community Relations Requests: The Ports Community Relations Department handles all requests for donations, auction items and guest speakers. Requests should be mailed to the Stockton Ports, 404 W. Fremont St., Stockton, CA 95203. All requests must be submitted four weeks prior to the event. The requests must be submitted in writing on the organization's letterhead. The letter should include the name of a contact person, phone number, tax ID number and a deadline for response. Requests submitted later than four weeks prior to the event, or without proper identification, may not be honored. Concessions: Banner Island Ballpark concessions are run by Spectra Food Services & Hospitality, which offers a variety of unique concession items and traditional ballpark fare. There are three full-service food and beverage stands with a full menu of food items, including (but not limited) to hot dogs, nachos, pizza, chicken strips, fries, snacks, beverages and specialty items such as Slush Puppies. These food stands are located behind home plate, next to the batting cages down the right field line, and down the left field line next to the Ports Shop. The Ports famous Centerfield BBQ Grill, now featuring great food provided by Kinder's BBQ, can be found directly behind the Batter's Eye, serving up items like Grilled Chicken Sandwiches, Ribs, Grilled Hamburgers tasty side dishes and beverages. As well, Club and Scout Seat Season Seat Holders have access to the exclusive Club area where they can enjoy special buffet-style dining options. The Club Area also offers table and bar seating on a first come, first serve basis. Diaper Changing Tables: There are diaper changing tables located in all of the men's and women's restrooms at the ballpark. Dining: Ports fans can enjoy their meals in their seats or dine in the Ports two alternative dining areas, subject to availability. Waterfront picnic style tables are located behind the Metro PCS Home Run Hill Seating in right field and are available on a first come, first served basis. The Express Transmission BBQ Pit Stop in left field is open to all guests, unless reserved in advance for group BBQs. Group BBQs typically last one-hour into the game, which is when the Express Transmission BBQ Pit Stop will re-open for all ballpark guests. Fans can also select to dine at the Tecate picnic tables along the top of the left field Monster Wall. Directions: From Interstate Highway 5- Exit Fremont Street in Stockton. Travel East on Fremont for about one (1) mile; From Highway 99- Exit Highway 4 (Cross-town Freeway) heading west. Travel to downtown Stockton and exit El Dorado Street. Travel North on El Dorado four blocks. Turn left on Fremont Street. Banner Island Ballpark is on left about .5 miles. For detailed directions visit the Ports Directions Page. Please be advised that eastbound traffic on Fremont may be redirected to Oak Street for access to Banner Island Ballpark. Disabled Guests: Guests with disabilities are recommended to contact the Stockton Ports at 209-644-1900 prior to attending games to learn more about the services and seating options offered by to guests at Banner Island Ballpark. Donations: All donation requests should be made in writing on company or organizational letterhead and mailed or faxed to the Stockton Ports. We apologize in advance that all donation requests cannot be accommodated. Please click here for details. Fan Mail: Letters and packages for Stockton Ports players and personnel should be individually addressed and sent to the Stockton Ports mailing or shipping address. Fireworks: Fans can watch firework shows following Ports home games on selected dates throughout the season. For those dates and other promotional/special event nights, check out the Ports Promotional Calendar. First Aid: The Ports first aid station is located on the main concourse area behind home plate. For all injuries and accidents, please report to the First Aid station or ask an usher or stadium staff member to call for First Aid. In case of an emergency, please seek assistance prior to calling 911. Folding Lawn Chairs: Folding chairs are allowed only on the Metro PCS Home Run Hill, located in right field. Chairs are only allowed on the grass and must not impede the view of other guests in this area. The Ports request folding chairs only be used on the back row of this area. Absolutely no lounge chairs permitted. Any chairs that are deemed to be a hindrance to other guests' enjoyment of the game are subject to removal by the Stockton Ports. Removed chairs can be claimed at the Guest Relations Booth upon exit from the ballpark. Foul Balls: Fans may keep foul balls. However, fans must not enter the playing field to retrieve balls or interfere with balls in play. Because of the close proximity of the field, all fans are cautioned to stay alert for thrown bats and thrown or batted balls, which may land in seating areas. The California League, the City of Stockton, the Participating Clubs, their agents and Players and other individuals are not liable for injuries resulting from such causes. Please be alert at all times. Game Times & Gate Openings: Ports regular scheduled Monday-Saturday games start at 7:10 pm. Sunday games start at 2:09 pm for the first half of the season and 6:10 pm for the second half (check schedule for exact dates). The Ports open the ballpark one (1) hour before home games. Special game times and opening times occur throughout the season for special events and promotions. Please call or check the schedule for the game(s) time and opening for the game(s) you plan on attending. The main entrance to Banner Island Ballpark is located on the north side of the ballpark off of Fremont Street. Season Seat holder and Suite entrances are located on the West side of the ballpark and are open until the third inning. Giveaways: Please remember that all giveaways are one per person not one per ticket. There is also no exiting and re-entering until all giveaways are handed out. We want every person to have a fair chance of getting a giveaway. Group Tickets: Discounts are available on tickets purchased for groups of 25 or more for all home games (excluding Opening Night and July 3rd). You can call the Ports for more information about booking group packages at 209-644-1900 or go to the Groups page for a complete list of options. Special packages for Birthdays, Company BBQs, and youth league sports teams are also available. Guest Interference: Guests are not to access the field at any time or interfere with players, equipment or balls in play. Any guest entering the field of play without permission will be considered trespassing and be subject to immediate ejection and criminal prosecution at the discretion of Ports Management. Guest Services: The Port of Stockton Guest Services Center is located near the main entrance, directly behind home plate. This booth is staffed to assist our guests during games and events. Information regarding the ballpark, the Ports and future events can be found here. As well, all questions regarding contest entries, public address announcements and Ports promotions can be directed here. Kids' Club, presented by Amy L. Scriven DDS: The Ports and Dr. Amy Scriven allows for kids to attend Ports games every Sunday! Members receive a membership card and special privileges all season long. 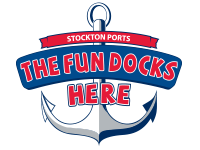 To learn more visit the Port of Stockton Guest Services Center or the Kids' Club page on the website. Membership is only $5 per eligible child. Kids' Zone: The Kids' Zone, presented by SJC Foster and Adoption, is located beyond right field. This area includes a bounce house, a giant slide, and a speed pitch game, where kids of all ages' can test their fastball. Lost & Found: Lost items may be claimed at the Guest Services Center located near the main entrance during games or at the Ports Front Office during regular business hours. Mascot: Splash, the Ports mascot, can be seen all around the ballpark throughout Ports games. Splash tends to make special appearances at group outings and birthday parties and is known for getting people wet at the ballpark. Splash is also available for event, community and special event appearances. Please visit Splash's page for more information. Merchandise/Souvenirs: Ports and Banner Island Ballpark souvenirs and merchandise can be purchased during games and during regular business hours from the Ports Shop located on the third-base line. During games, guests may also visit the Ports merchandise kiosk located down the right field line. The Ports Shop is also located online. National Anthem Singers: The Ports are looking for National Anthem singers/musicians at Banner Island Ballpark. Parties interested in performing may contact the Ports front office at 209-644-1900 or send a non-returnable tape/CD with their contact information to the Ports front office at Banner Island Ballpark. Newsletter: Keep up with everything about the Ports and Banner Island Ballpark through the Ports E-Newsletter. The newsletter is absolutely free and includes updates on games, promotions, events and lots more. To sign up, please visit our Ports Post e-newsletter page. Noise Makers: Noisemakers, cowbells, air horns, drums, cell phones, and all items that make a noise are allowed into the ballpark. However, their use, frequency and location are at the discretion of management. If there are complaints about these items being used, their use should be stopped. If necessary, the item may be checked into the Guest Services Center until the end of the game. Outside Food & Beverage: There is no outside food or beverage of any kind allowed in Banner Island Ballpark per California League rules. The Ports do not allow glass bottles or thermoses of any size to be brought into the ballpark. Fans bringing in baby food or medically related food or beverages should contact the Ports prior to attending the ballpark. Soft-sided coolers containing pre-approved items that are small enough to fit underneath your seat are permitted but subject to inspection. Parking: Parking lots and surrounding area maps can be found on the Directions Page of the Ports website. The Ports do offer parking passes, sold on a limited basis to season seat holders. Day-of-game parking (assuming space is available) is $5. Pets & Animals: Registered seeing-eye dogs and/or assistance dogs are allowed into Banner Island Ballpark. Pets and animals are not permitted in the ballpark with the exception of designated promotional nights. Photography: Fans are welcome to bring cameras into Banner Island Ballpark to take pictures. However, any resale of photography for any purpose is strictly prohibited. Team name, logos, player likenesses are all copyrighted material of the Stockton Ports. Video cameras are not permitted. Playing Field: Banner Island Ballpark is a natural grass facility. The grass is a hybrid blue grass on a combination sand and clay soil. The playing field is approximately eight feet below street level with a unique asymmetrical outfield wall. A small foul territory down the lines, a short porch to left field and a radial arced fence protruding in right field makes the park a hitter's field. LF (300), CF (399), RF (326). Premier Staffing Club: The Premier Staffing Club is located next to the suites on the first base line. The club features a full bar and table area, with access to rows of cushioned seating in the seating bowl. Individual passes to the Club are occasionally available in limited supply on a game-by-game basis. Please see our Premier Staffing Club page for more information. Public Address Announcements: Fans wishing to have a birthday, anniversary or special welcome announcement made should visit the Guest Services Center. Announcements are $10 each, and can be purchased at Guest Services or online. Please submit requests before the fifth inning. Announcements are made in the end of the sixth inning. Paging of guests and special requests are permitted in emergency situations only. Radio: The Ports 140 home and away games are broadcast all season long on KWSX 1280 AM or by logging onto www.stocktonports.com and clicking on the Listen Live link. Fans can learn more about our broadcast schedule on the Ports website. Radios with headphones are permitted in the ballpark so long as they do not interfere with other fans' enjoyment. Rain Check Policy: All persons in possession of a reserved ticket to a canceled or rescheduled game may exchange the ticket at the Ports ticket office for a ticket to a future game. Tickets to a postponed game can't be exchanged for future games. All tickets exchanges are subject to availability. There are no refunds on ticket purchases. Re-entry: Guests wishing to leave Banner Island Ballpark and re-enter must have their ticket stub and hand stamped. Guests can get their hand stamped at the main entrance. No guest may enter Banner Island Ballpark without a ticket to that date's game. Restrooms: Both men's and women's restroom facilities are located on the first base and third base lines of the concourse at Banner Island Ballpark. Family Restrooms are also located next to the Ports Shop and behind home plate next to the First Aid Station. Run the Bases: The Ports and SJCCOA welcome kids 12 and under onto the field after Sunday home games to run the bases. Kids wishing to participate should line up in front of the Batting Cages after the game. Kids' Club members get to be first in line! Security: Security Team Members are present at all Stockton Ports home games and events held at Banner Island Ballpark. Ports Security personnel can be identified by their uniform. Any emergencies should be reported immediately to an usher or security personal. All fans and bags/purses are subject to search at any time upon entering Banner Island Ballpark. Silver Sluggers Club: Presented by SCAN Health Plan. The Silver Sluggers program allows seniors 55 and older to come to all Wednesday home games for FREE. The cost is $25 to become a member of the club. In addition to a Wednesday ticket, members also receive a Silver Slugger card and attendance incentives. To learn more visit the Guest Services Center or visit the SCAN HP Silver Sluggers Club page. Smoking: Banner Island Ballpark is a non-smoking facility. Guests wishing to smoke must exit the ballpark and re-enter through the main entrance with a ticket and their hand stamped. Suggestions: The Ports welcome suggestions for making your visit to a Ports game more enjoyable. Stop by the Guest Services Center with your suggestions or call, mail or email thoughts to the Ports at info@stocktonports.com. Team Store: The Ports Team Store is located down the left field line behind Section 103. The team store is open to fans during normal business hours and during games. For more information, please visit the Team Store Information page or visit our Official Online Team Store. Tickets: Tickets may be purchased in advance at the Ports' Ticket Office located at Banner Island Ballpark, by phone at 209-644-1900 during regular office hours or online. Same day tickets may be purchased at the Banner Island Ballpark ticket windows located next to the main gate. Tickets may also be purchased during games at the Ports Advance Window located on the concourse next to the main entrance. The Ports welcome purchase by cash, credit and personal checks with a valid ID. Phone orders are not take after 5:00 on game days. On busy days, phone orders may be cut off earlier. Transportation: Guests visiting Banner Island Ballpark can travel to the ballpark in a number of ways: Parking in designated lots around the ballpark; Using designated pickup and drop-off points located off Fremont Street; Using the SJ-RTD Trolley Service from downtown parking lots; or by taxi. Groups traveling by bus should contact the Ports prior to the game they are attending to receive directions for parking availability. Marina and dock space at the Downtown Stockton Marina will allow guests to travel by boat to Ports games. Umbrellas: Guests may bring small umbrellas into Banner Island Ballpark so long as they do not interfere with other fans' enjoyment of the game and are not in the seating bowl. Will Call: Tickets purchased in advance may be picked up at the Will Call window located at the main entrance of Banner Island Ballpark. Guests may also leave tickets for other parties at Will Call.